Dressed in a harvest-gold, damask-patterned sherwani – a coat-like lengthy garment common in India – President of the India Association of Long Island, Lalit Aery, zipped between tables as he greeted the 300 people dropping in their banquet to celebrate Holi. The ancient Hindu festival of colors, which was observed on March 20, marks the arrival of spring. The event was an opportunity for some Long Islanders to celebrate their culture and heritage in a large group at The Cotillion, a restaurant located in Jericho, New York. Indian classical dances like Bharatanatyam, as well as modern dance moves popular in Indian music videos, were performed. Guests also enjoyed vegetarian manchurian gravy with jeera pulao and naan, among other options that fit many Hindus’ vegetarian diet. The most popular part of the holiday celebration, throwing dry colored powder known as gulal at each other, is now a fun activity people of all cultural backgrounds enjoy. But the meaning behind it is more than symbolizing the arrival of spring, Hargovind Gupta, secretary of the Indian Association of Long Island, explained. The Long Island Children’s Museum collaborated with the Srijan Dance Center to also host a Holi event of their own March 24 where they had traditional dance performances and shared Indian myths. Maureen Mangan, director of communications and marketing at the Long Island Children’s Museum, said the event was part of their attempt at reflecting the changing community in the region. 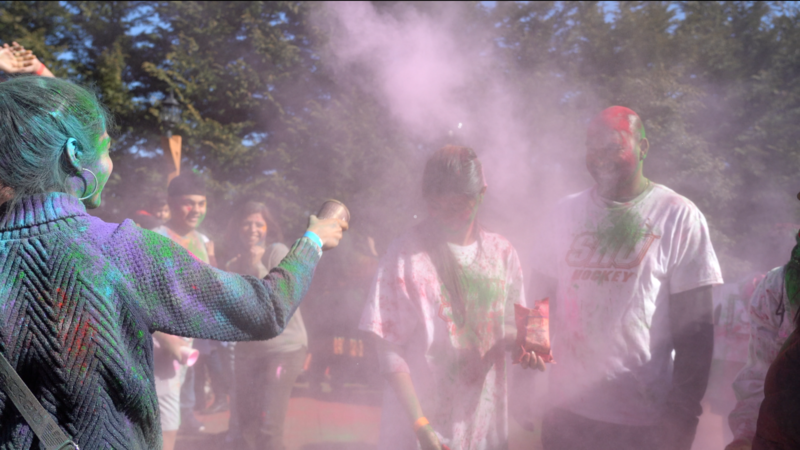 “It’s a way for us to introduce the traditions [of Holi] to a lot of families,” Mangan said. Throughout the event, children were invited to learn more about different Hindu clothing in an exhibit with costumes from various Indian regions. They also created their own masks and bracelets while learning about Hindu heroes. Zahid Syed, a community activist and commissioner of the Nassau County Commission on Human Rights, was awarded for his community service by the Indian Association of Long Island. At a time when religious minorities are targeted Syed stressed the importance of humanity and different communities working with each other.